Both Asmara and Mutiara were both meticulously trained for the cockfight in front of the Sultan’s Palace. On the day of the fight, many people came to watch it. The fight commenced with the roosters pouncing, pecking, attacking and kicking each other cheered on by the excited spectators. Suddenly Asmara flew out of the ring followed by Mutiara. Asmara had been stabbed during the fight and was seriously injured. 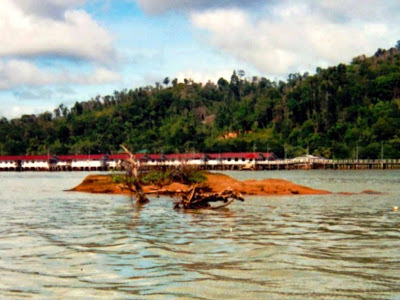 Asmara fled out of sight and succumbing to his wound, fell down into the sea turning into a rock becoming an island (Pulau Pilong-Pilongan). Mutiara who tried to give chase, fell into the river cursed by the King of Majapahit. 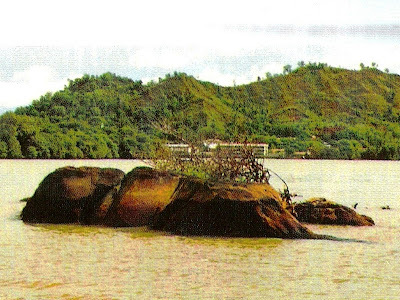 He too turned into a rock and became an island (Lumut Lunting). Note: An edited version of the above article was published in The Golden Legacy column in The Brunei Times dated 28th April 2007.